It’s one of those Virginia days that felt hot before the sun had even risen to its highest point in the sky. Stepping outside brings on instant sweat, and you’ve spent the whole running from your air conditioned car to the air conditioned office and back again. All day long you’ve been dreaming about getting back to your house and cranking the air conditioning, but as soon as you walk through the door, you notice a problem: your whole house is just as muggy as the outside. You run to check the thermostat and are shocked to see the temperature is over 76 and climbing. You start to panic, thinking about how expensive emergency AC repair is going to be. Before you start looking for household items to pawn, go through this short list of troubleshooting tactics. And if they don’t work, remember that the repair experts at All Air Heating & Cooling Services are only a phone call away! Summer is the season of rolling blackouts, which means that it’s possible your AC unit just lost power and isn’t actually broken. 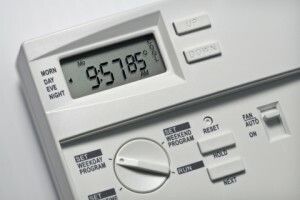 Checking your breakers is the very first thing you should do if the air conditioner is switched on but not putting out any cool air. Remember that different circuits control different parts of the house, so even though you’ve got power in one part of the house, your air conditioner breaker could still be tripped. Within a few minutes, you’re going to start feeling hot. Uncomfortably hot. While you’re waiting for emergency AC repair, be sure to set up some alternative cooling solutions. If the sun has set, open the windows and set up some fans to blow the hot air from inside out the window. Turn off all unnecessary lights and resist the urge to cook, which makes the temperature skyrocket. Looks like you’re ordering pizza delivery tonight! Most importantly, resist the urge to make repairs on your own. Air conditioners are very complicated appliances and trying to diagnose the problem yourself could just lead to even more expensive emergency AC repairs. Don’t spend any more time in a hot house than you have to, call All Air Heating & Cooling Services for emergency AC repair right away.